Controlled Labs has unveiled a top of the line fat burner in Red Ghost. Controlled Labs introduced a fantastic formula which features clinically dosed ingredients to promote the high intensity fat burning process minus the jitter and fatigue effects associated with some thermogenic amplifiers. Red Ghost also acts as a hunger reducer and promotes sharp mental focus so you can really bring out the max effort in your training! INGREDIENTS:Gelatin (Capsule), Microcrystalline Cellulose, Magnesium Stearate, FD&C Red #40, Titanium Dioxide (Color), FD&C Blue #1. Initial (first serving) Directions: Start by taking 1 capsule to assess your individual tolerance. If you experience any unusual occurence, stop and consult your doctor. Directions For Regular Use: Take 4 capsules before breakfast OR lunch. Never exceed 4 capsules per 24 hour period. 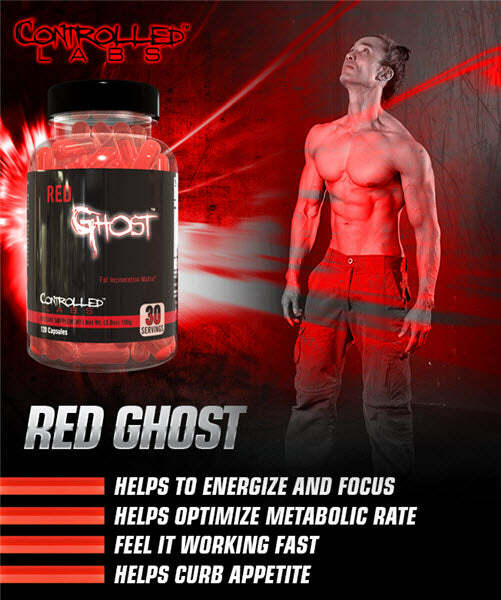 For best results, Red Ghost should be used in combination with other Controlled Labs products, at least 8 glasses of liquid per day, regular exercise and a high protein/moderate carbohydrate diet. Gelatin (Capsule), Microcrystalline Cellulose, Magnesium Stearate, FD&C Red #40, Titanium Dioxide (Color), FD&C Blue #1.